Centre set up in Idlib to protect Syrian heritage sites. ASOR undertakes humanitarian heritage work in Idlib Governate. 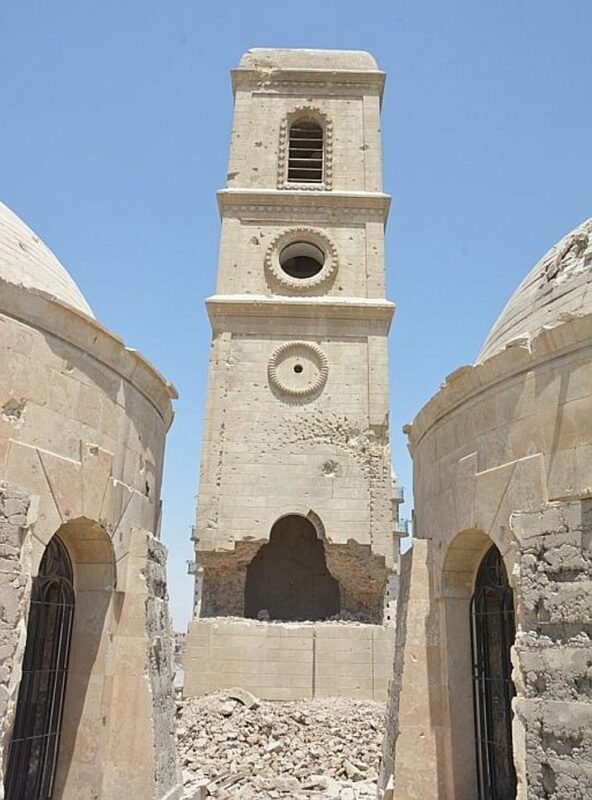 New video footage shows damage to the al-Sa’a “Clock” Church, a mid-19th century Roman Catholic church in the Old City of Mosul. The ASOR’s Cultural Heritage Initiatives August 2017 Monthly Report is now available here. Areas in the center of Damascus and its districts were shelled. The shells targeted areas of Al-Kesa, Old Damascus, and Bab Sharqi and the neighborhoods of Al-Amin and Al-Abasyeen, causing material damage, and left 7 people injured, while several shells fell on places in Jermana area in the outskirts of the capital, leaving at least 6 people injured. Learn more on the Syrian Observatory for Human Rights website and Sputnik News. The Association for the Protection of Syrian Archaeology have released a photo and some information regarding a looted mosaic in Idlib. See the photos and the details here. A play designed around the kitchen tells the story of a Syrian woman searching for the man she loves through war-torn Syria and performed by Nora el Samahy. Learn more about it from The San Francisco Chronicle. The Syria Times examines traditional Syrian crafts and the threats those crafts face today. Syrian archaeologist and art historian Dr. Afif Bahnassi died on November 2, 2017. Read more on the SANA website here. The Syrian Cultural Heritage Protection Centre has been set up in Idlib to document damage to heritage sites and try to better protect these locations. Read more on the TRT World website here. “Mr. Arbash promised that a heritage village is will be built in Damascus Countryside to include 33 old traditional handicrafts” according to The Syria Times. Mr. Arbash is the chairman of the“Vocational Society for Oriental Products”. The Authority of Tourism and Protection of Antiquities has documented archaeological sites in the south countryside of Hasaka city. To learn more see here. A new English-language bookstore in Homs is part of local efforts to preserve Syria’s built heritage. Read more on the Irish Times here. Hykait Bald is the the title of the first heritage exhibition established by Idlib Antiquities Centre. The exhibition shows mosaics and paintings inspired by the country’s heritage. The Authority of Tourism and Protection Antiquities in Al Jazira Canton are publicising the opening of a photo gallery ‘Woman and History‘ as part of the International Day of Violence Against Women. It will run in the Centre of Culture and Art in Amuda city for two days – on Monday November 20 and Tuesday November 21st. A television program called the Shunwar Program aimed to introduce and explain the importance the archaeological sites in Aljazira Canton to the locals people. The program was shown on Rogue –Ava channel and is supported by it. This Facebook video shows the creation of new paving of white limestone stones in Aleppo, using a method which is more than a thousand years old and is inherited through generations. Working with local Syrians, The Day After Heritage Initiative Project (TDA-HPI) and ASOR have completed repairs on a deviated wall at Al Ma’ara Museum (aka Murad Pasha Caravansary) following 2015 and 2016 aerial bombardment. ASOR CHI has undertaken humanitarian heritage work in Idlib Governorate and looks to raise $5,000 for emergency mitigation work. More details on the ASOR website here. ICCROM have released a new publication to help preserve documentary heritage. SOIMA: Unlocking Sound and Image Heritage is a web-based and freely downloadable book that offers tips and advice from dedicated professionals from all corners of the world, for the preservation and creative use of sound and image heritage. Download SOIMA here. FEMA has published Heritage Emergency National Task Force reference sheets for salvaging water-damaged collections in several different languages. “UNESCO’s Member States on Tuesday closed the 39th session of the Organization’s General Conference with the adoption of a series of programme decisions. […] With regard to the Culture Sector, the General Conference revised the strategy it adopted two years ago for UNESCO’s work in protecting culture and cultural pluralism in the event of armed conflict. The revised strategy now covers natural disasters alongside armed conflicts. As part of the General Conference, UNESCO hosted an international high-level panel on 6 November 2017, which brought together Ministers from Iraq and Mali, the Chief Prosecutor of the International Criminal Court (ICC) and international experts to strengthen cooperation in response to cultural cleansing and violent extremism. Read more here. Interpol has released a brochure outlining the need for a specialised unit dedicated to cultural property crimes. Download the brochure in English or Arabic. Iran, Russia, and Turkey met for the International Syria Conference in Astana, discussing a range of topics including preservation of Syria’s cultural heritage sites. Read more on the Iran Front Page website here. Al Masdar News reports on the extensive thefts of antiquities and monuments from Palmyra by IS, quoting Mohammed Al-Asaad, director of the Palmyra Museum: IS “committed terrorist acts and stole everything they could lay hands on in Palmyra and the surrounding ancient areas. Tourists visit Syria – Colin Thubron wrote of Damascus for the BBC here, and Roger White saw much of the country here. Colgate University’s conference on cultural heritage and conflict examined how large scale cultural property theft and destruction occur during times of instability. Read more on the Cultural Heritage Lawyer Blogspot here. The Waltham Forest Echo website discusses the London Syrian Ensemble, comprised of Syrian musicians, which will preform on Thursday November 2nd. ASOR is pleased to announce a photography contest for images depicting cultural heritage in the Near East and Mediterranean World.These photographs may illustrate any aspect of tangible or intangible cultural heritage. Any student-member of ASOR (undergraduate or graduate) may submit their own original images. The Australian writes about the online sale of Syrian antiquities. The Washington Diplomat reports on war economies in Libya, Syria and Iraq, including discussion of antiquities looting. The Wall Street Journal reports on the sale of antiquities through platforms such as Amazon, eBay, Facebook and WhatsApp. An opinion piece in The Globalist examines why cultural heritage matters. Business Insider discusses how online platforms such as Amazon and eBay could be more proactive in addressing the online trafficking of looted antiquities. CBC News reports on a small school in Halifax, Canada, where Syrian students study Arabic and learn about their cultural heritage. Vice News Canada showcases photos of Aleppo from August and September of this year, showing areas that will eventually undergo reconstruction. The Art Newspaper examines how art collectors are addressing the rise of fake Modern Middle Eastern art, including the work of Syrian Modernist Louay Kayyali. The Jordan Times reports on Zikra, a social enterprise with locations in Syria and other MENA regions that connects urban and rural communities through cultural exchange. Open Democracy discusses how Syrians in Turkey continue to connect culture, heritage and politics.